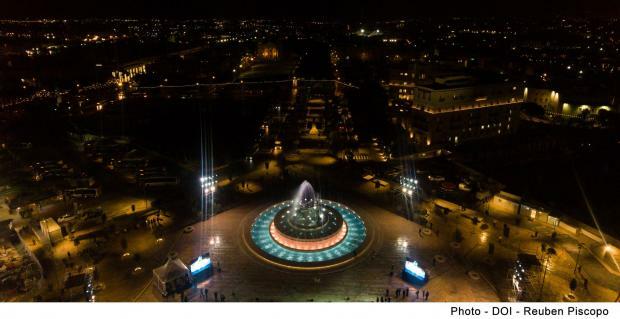 The restored Tritons Fountain in Valletta was inaugurated by Prime Minister Joseph Muscat on Friday. During a ceremony, the Prime Minister praised the work being carried out on Valletta and said there were still challenges to be met, in particular the regeneration of the lower part of Valletta. The fountain was originally completed in 1959 but it sustained damage along the years. The fountain and square now present a fitting entrance to Valletta, which will officially take on the mantle of European Capital of Culture next week. The budget for the restoration of the landmark statue had gone up to €4 million from a projected €2 million, due to the poor condition of the fountain's basin and figures. The extensive damage to the artistic bronze works, including the fact that the internal parts of the statues were filled with concrete, necessitated the transportation of the bronze structures to Italy and their restoration at a foundry. An aerial view of the entrance to Valletta.